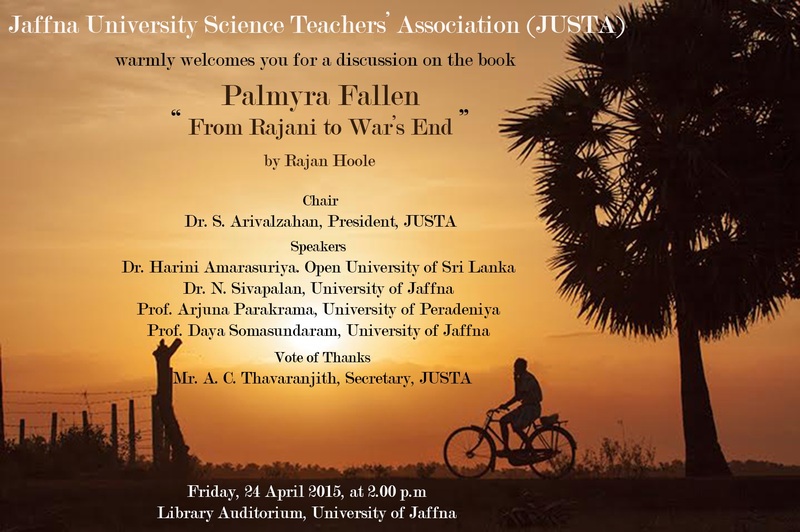 Event Invitation: Discussion on Dr. Rajan Hoole‘s Palmyra Fallen – From Rajani To War’s End. Its is IN SRI LANKA ! When did Jaffna become NOT Sri Lanka?? It is time to put an end to what is now becoming an annual farce held by a mutual admiration society of kins. A clan with social capital amassed by brown nosing the colonial rulers and taking charge of the Christian churches and schools in Jaffna is now shamelessly taking advantage of a scorched land. Even a person with average intelligence and an iota of conscience knew at the time the Tigers were Fascist cannibals. Rajini and Nirmala who paraded themselves as radical Marxist feminists jumped on the patriarchal far-right LTTE bandwagon at the first opportunity to gain cheap fame. They became champions of democracy and human rights only after Prabhakaran kicked them out. But by that time they had done considerable damage to the nascent left in the Tamil armed struggle. Now the Rajasingham-Hoole-Nesiah clan is using Rajini’s death as a platform for self-promotion. What a travesty! You may aware that even Anton Balasingam paraded as a Marxist, especially when he wrote his article in the Labour Review in 1979 a section of the Labour Party left tendency based in UK on why the JVP failed.that was long before he had contact with the LTTE. If Nirmala and her sister who were in SL at that time were deceived into believing that the LTTE was left oriented ,a belief which the LTTE itself propagated, a deception for the sake of it’s own benefit and perhaps perceived respectability. Therefore I think to blame them for that is unfair, because when they realised that the LTTE was indeed fascistic they immediately cut off their association with the LTTE. That is exactly one reason why Rajini was murdered by the LTTE only because she was in Jaffna and her sister had escaped abroad otherwise she too could have become a victim. As an agnostic let me prefer to ignore your belching about about Christian church activity in Jaffna. What an indictment of the Tamils of the North and East, all over the diaspora and many others besides!! To name but a few: Anton Balasingam, N Satyendra, S Sathananthan, Prof Sornaraja, C J Eliezer, A Thurairaja, Sachi Sri Kantha among others in a very very long band wagon. All lacking average intelligence and/ or an iota of conscience !! Fascist cannibals yes and much worse but I doubt if average intelligence and an iota of conscience would have sufficed. In any event you are a miserable fool to speak as you do of the courageous and self-effacing author of this invaluable record. And in bringing into this, the other names – are you perhaps betraying your own incubated malice? The credibility of the author Dr.Rajan Hoole, who writes stories with hidden agenda is in question. 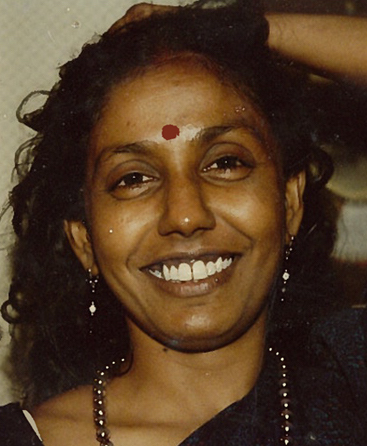 According to Dr.Rajan Hoole’s UTHR report, K.Thayapararaja was KILLED on the 15thSep.2009. Dr.Hoole,was KT really killed in 2009 ? Don’t you know that KT and his family sought asylum in India in 2014?Would you admit that you write lies(this is tip of the iceberg) to please your masters? It is funny that everyone here trying to establish who killed Rajani LTTE, EPRLF backed by IPKF, SL government etc. Everyone has their theories but no solid evidence. Everyone say this COULD BE and that SHOULD BE. No one says, this is what EXACTLY happened. Theories cannot alone prove anything, even Dr. Hoole should know that (I am saying his name here as he is a scientist. A scientist know his/her theories are not accepted until it is proven). There are documentaries in Rajani’s death in the web from all sites but nothing substantially giving REAL evidence but one sided arguments. With no real evidence what is the purpose this serve – only self propaganda or hidden agenda or both. Remembrance is good but NOT this propaganda. There are far more unwanted killings of champions in the history Eelam Tamils. You all can read that book and write articles or have discussions anywhere in Srilanka. We all know that VC was a political appointment and there are number of issues with her management. It is a different matter. JUSTA has to do lot in the field of Science rather than wasting time on discussing a book written by prof. Hoole. There are number of challenges in the North such as water pollution, health related problems, socio economic problems that needs urgent attenion of the University. It appears that there is some political motive behind this move. Don’t make University as a political playground.